The Hope Series - Limited Edition! Just 4 copies of each available! Finally! Announcing the long awaited release of John B. Levine's four albums recorded at The Concert of Hope. 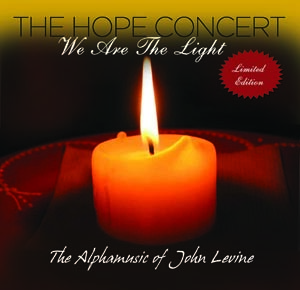 The Concert of Hope was recorded on 22nd November 2015 with a live studio audience. This is currently a limited edition issue, so be quick and get your copy whilst you can! Hurry only 4 copies of each Album available from us and just 3 copies of each available at Especially Health Store. Recommended for stress, insomnia, concentration, depression. * Discounted full 60 min version, standard price £28.00! Save! John Levine has vast experience as a composer and as a teacher of meditation. He believes that music has a powerful effect on the brain and can be designed to induce specific positive changes in mood and behaviour. The idea for this particular concert first came about through John Levine’s hospice tour many years ago. John would visit care homes and hospices and play his Alphamusic to the residents, patients and staff. At the start of the concert John would ask his audience to choose three positive emotions and everyone would vote for their favourite. The emotion with the highest vote would be the title of the composition John would produce live. During the concert at the Arthur Rank Hospice in Cambridge, a patient in the front row who voted for ‘hope', had the opportunity to hear John’s composition performed live. But halfway through, she began to shed tears until the end of the concert. When John finished playing, he was ready to apologise as he didn’t want to cause any upset, however instead the lady congratulated him because it moved her so much. So when Wendy Kent from Especially Health approached John to perform a concert, he decided to dedicate it to the memory of the terminally ill cancer patient from Arthur Rank. Listening to the Hope albums gives a sense of tranquility, helping you feel more expansive and enhancing clarity, where the spaces between thoughts are gently expanded. John has allowed the angels to play through him. This music brings hope and peace to the world. I feel very peaceful now. This music really heals. I've got them for fun, as I am rather sceptic person. But from the day one I have noticed changes in my sleep pattern.